While some of us have been holidaying, our very own Nova Swimwear Sponsored Danielle De’Francesco has been training hard and competing even harder, which has produced some outstanding results. At the end of last month Danielle competed in the Burleigh Swim Run which consisted of a 200m swim, 1.92km run…and repeat. Danielle came out of the swim ahead of the competition and was able to maintain the lead throughout the race to take the win in the elite category. After that, Danielle attended the Miami Super Challenge which was held last Saturday. She competed in the 400m freestyle where she placed 1st with an outstanding 1min 03sec personal best time. She continued her run of success when she backed up and won the 100m Freestyle with a 1 second improvement on her personal best time. “I was surprised that I was able achieve such good results after a big week of hard training, ” She said. 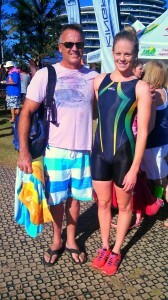 Danielle then competed in the Australia Day Burleigh Swim Run Finale, which consisted of a 400m swim and 3.84km run. The surf whipped up some messy and challenging conditions which forced the event coordinators to place the swim buoys close to shore. “Shortening the swim was a bit disappointing for me because my swim is my strength,” She said. Despite the shortened swim, Danielle was still finished a strong 4th place. Danielle’s next competition at then NSW State Championships will be held in a few weeks, closely followed by National Championships which is also a trial for the Commonwealth Games! From the Team at Nova Swimwear, we wish Dani the best of luck at her upcoming events and the very best of luck at the Commonwealth Games Trials!